Ah, yes. The query letter. I’m taking an online course titled The Craft of Magazine Writing through UCF’s Continuing Education courses with ed2go.com. This is my third writing course through this venue. All three courses have been/are excellent. I was leery to take an online course for writing, but that was quickly wiped from my mind as the courses are much more than an expected. I highly recommend ed2go which is a huge hub for worldwide online courses. They are affiliated with UCF and since UCF is where I work, I chose them. So, back to the query letter. Lesson 4 assignment is to pick a topic (from a list I made in Lesson 2), then pick 10 magazines related to my topic, and finally to write a query letter. Just narrowing down the topics was difficult, then I got writer’s block. I couldn’t think about what to do so I stared at the list. For days, I stared at it. Finally, it dawned on me that I was just afraid (that fear factor) of maybe not being able to compete with experienced writers. It was all fear, not the topic. Yesterday, after long meditation, it all came to me. So simple. The topic of my article will be “Preserving Precious Memories” (same as my website theme). Duh. Early this morning I started writing the query letter, which is, by-the-way, a professional letter to the editor of a publication requesting they consider my article for their magazine. It includes the title, opening “hook” sentence and paragraph, what I will cover in the article, how many words, and basic standard query elements. There are standards that have to be adhered to in a query letter and, in addition, each publisher has their own guidelines. If these aren’t followed precisely the letter can be tossed quickly. Not good. Took me a while to grasp the idea of query letter before even writing an article. I just assumed one wrote the article and submitted it to a magazine. Doesn’t work that way (there are exceptions, but few). This morning I wrote my first query letter. Not sure if I’ll even submit it to a magazine. After it gets critiqued by my instructor, revised, I’m guessing a future lesson will require me sending it to various editors (those 10 magazines I picked earlier). Another fear factor to deal with, but I’ll worry about that later. Love the writing course. Love writing. The more I learn the more I write the more I love it. Just got my instructor’s critique: “Superb Marylou. Really strong, looks great…this is good to go.” Yeah!!! 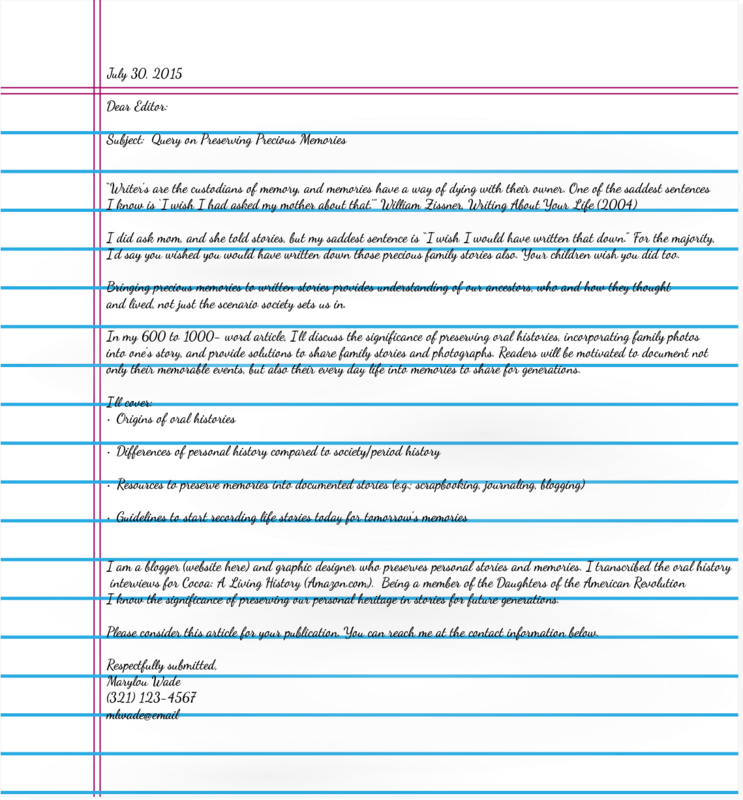 Have you ever written a query letter? Do you remember writing your first one?